Welcome to May everyone! Let’s start off the month by checking out the inks to page 07 of Mission 004. 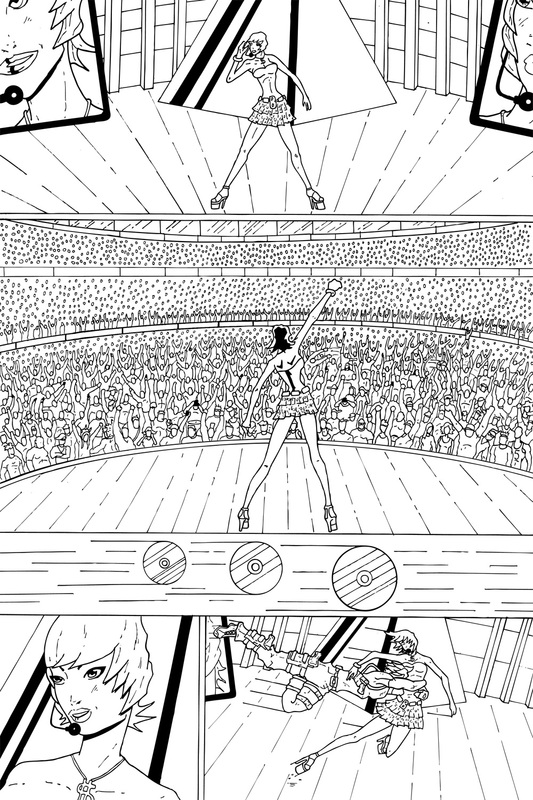 It goes without saying that inking a stadium full of hipsters was the hardest and most time consuming part when doing this page. I didn’t want to cheat the crowd or just do floating heads for every single person. I wanted to go as detailed as I could as far back as I could to make it looks like Justine Beaver was in front of a crowd of thousands. Between the pencils and the inks I doubled the amount of heads in the background just to make sure that it looked like a sold out show. As I was inking it I was adding more and more details to the crowd so they started to become individuals. In some future pages I even used the same characters as they were so much fun to design. In other nerd news I’m off to see Iron Man 3 tonight and I couldn’t be more excited! I managed to win tickets off the radio and as my birthday is on Monday I’m considering this an early present to myself. I’ve loved every single Marvel Movie since Iron Man (yes, I even enjoy Iron Man 2) and it looks like Iron Man 3 is out to take on even The Avengers. Let me know what your most anticipated super hero movie is in the comments below!